The horrible beauty of nature. Or to put it another way, the balance of nature. But before I go into that: I updated the rose page to include pictures of my newest rose (which I actually planted last year): ‘Fairy Tale Brothers Grimm’. I’m a bit of a sucker for orange roses, and this one is gorgeous. Anyway, tomato hornworm is generally not a problem in my garden – I know many people have terrible trouble with them, but in my garden, they don’t usually show up until around now, when the tomato plants are winding down and there’s only a month max before they have to go on the compost heap. In addition, I never have many of them, and the ones I do get – I don’t get for long. Let me explain. Tomato hornworms are easily confused with tobacco hornworms – they are both the caterpillars of moths of the genus Manduca and they both feed on both tomato and tobacco plants. The easiest way to tell the difference is the colour of the “horn” on the caterpillar’s rear end. True tomato hornworms (M. quinquemaculatus) have dark blue or black horns; tobacco hornworms (M. sexta) have red horns. 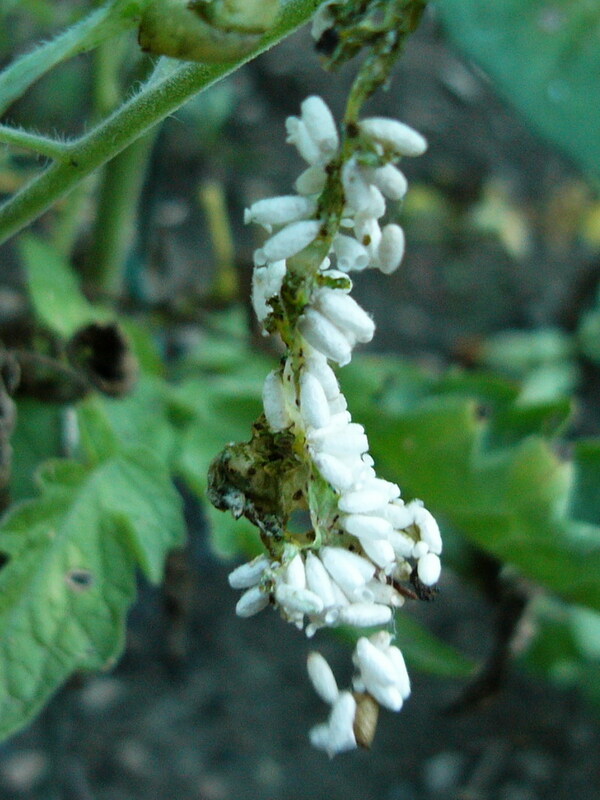 In fact, I was somewhat misleading when I said I don’t have much of a probem with tomato hornworms, because the ones that show up in my garden are actually M. sexta. The adults are commonly called hawkmoths and sphinx moths. Both sorts of caterpillar are commonly parasitised by braconid wasps. The adult female wasp lays her eggs on (or in) the caterpillar. The wasp larvae then literally eat the caterpillar from the inside out before emerging to pupate. This of course kills the caterpillar, so technically the wasp is considered a parasitoid – true parasites are reckoned those that don’t kill their hosts. What you are seeing in the picture is the dangling remnant (exoskeleton) of one such caterpillar – the only one I found on my plants this year. And the only reason I found it is because it was already in the stage you see. The white objects are the pupating wasps. If you look closely, you can just about see the red “horn” near the bottom (the lowest cluster of pupae is actually dangling below the caterpillar by a thread, so the horn is right above it). You can also see that there is just a hollow skin left of the caterpillar itself. This, then, is the balance of nature. The adult wasps feed on nectar and pollen, so by ensuring my garden has lots of flowers that produce these food sources, I encourage the wasps to stick around. When the caterpillars show up, they do some damage to the tomato plants, yes, but it’s not long before the wasps do their thing. And by NOT picking off the hornworms when I see them, I guarantee that future generations of wasps will be present, and future infestations of hornworms will be controlled.